12 years ago, in a round about way, I gave myself the best gift I could ever give myself. For Father's day in 2001 I got together with my brothers and sisters and we worked on a gift for my dad. Everybody wrote down random memories that they had of my Dad. Things they remembered from growing up, things they remembered as adults. It didn't matter when the memory was from it just had to be a memory specific to them, about him. 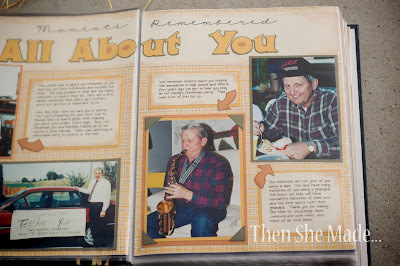 Once they had their memories listed they sent them to me and I typed them up and made my dad a scrapbook of sorts of our memories. Then I tied some raffia around it, wrote a poem telling him what it was, and sent it his way as a Father's Day gift from his kids. I had forgotten about that book until it was pulled off of his special shelf in his closet and put on display at his funeral last week. 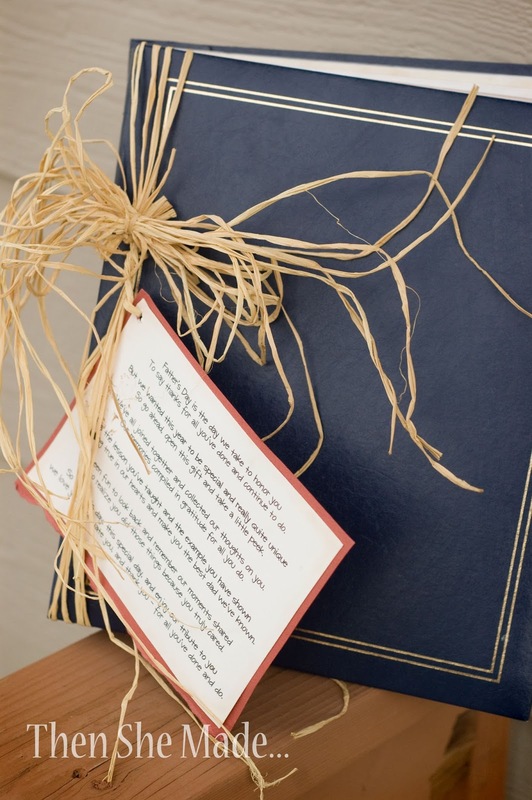 It still had the poem and raffia attached much like the day it was given to him. The interesting thing is, this gift was for him but now, this book is a gift to me and my siblings. I am so glad I made this book! I used to scrapbook all the time but kind of let that hobby slide. I'll be bringing it back though because I've been reminded about how important it is to document life and record relationships. So, let me tell you about this book. I wrote the poem on the front and it sums it up. To say thanks for all you've done and continue to do. So go ahead, open this gift and take a little peek. Our memories compiled in gratitude for all you do. And to realize you did those things because you truly cared. We love you, appreciate you, and thank you - for all you've done and do! Then we get into the sections that were from each kid. The all started the same way "I Remember..."
Each kid had a page on the left (not shown) that had a quote and a few pictures of just them with Dad. 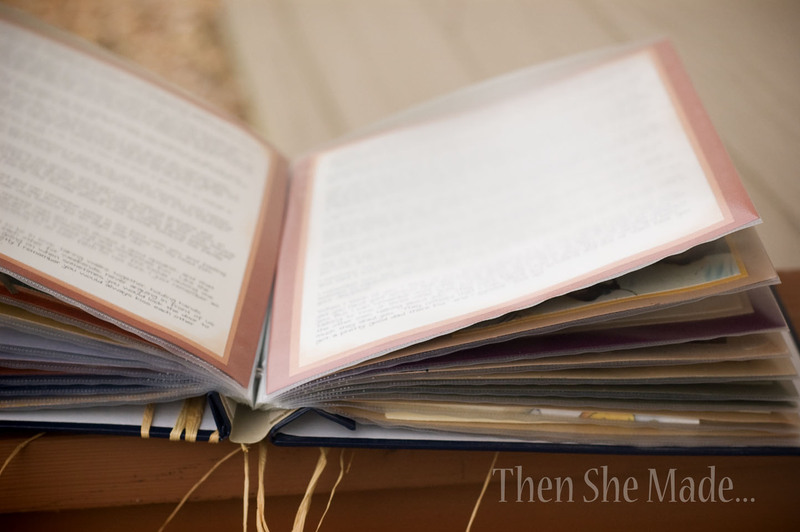 Then, like in the photo above, it was just paragraphs of memories. They were listed randomly, not in chronological order or anything special. 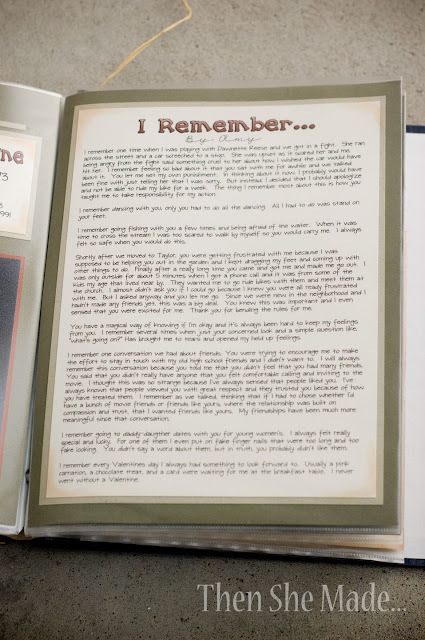 Each kid shared three pages of memories. I remember my dad telling me after he had read through the book that he didn't remember a lot of the things that we had. Isn't that true though, my memories are going to be different from my kids and theirs will be different from mine but it's still worth documenting. I am so grateful I wrote my memories down because there are some that I had already forgotten; like how my dad reacted when my husband asked for my hand in marriage. (Don't worry, it was good) And how he knew I didn't like being called the "baby of the family" so he called me the "caboose" instead. And how he let me set my own punishments when I did something wrong. I was always a lot harsher than he would have been. I also added in some pages in between the sections that included our memories doing the things he liked to do like hunting and fishing and a page or two on his love for my mom! And, in the very back I included a section called "Letters of Love" which was a place for handwritten letters from me and my siblings. 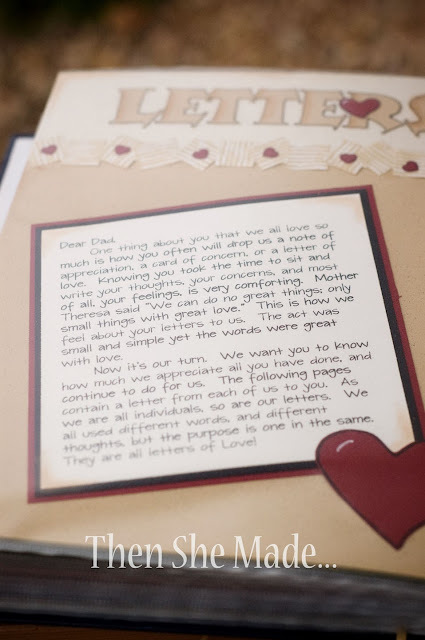 My dad was always so good about writing us cards and letters of appreciation and it was nice to do the same for him. I pulled out the letter I had written him the other day and just cried. I'm so grateful that I took the time to tell him my thoughts and how much he meant to me. I know the letter was written 12 years ago and I've expressed those same feelings since but there really is something about having it in writing and knowing he knew that we loved him. So, like I said earlier, this gift was for him but years later, it's really a gift for me. It's been a great reminder to be better at writing things down. And, if there is anything positive that I can share or encourage others to do, it's the same, grab a note book and start writing down your memories. Don't worry so much about getting them in order, just write! And, whether they stay in a notebook or get put in a scrapbook, it doesn't really matter - at least they will be recorded! Oh my gosh, how prescient! 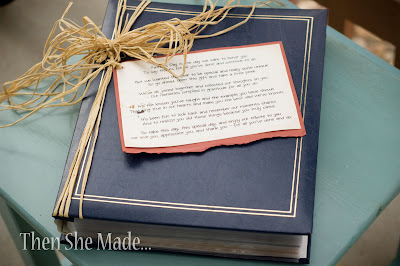 I do hope you take up scrap booking again, you are my "push",,,I still have the book s you made for me! Actually was looking at "Where in the world is Alan Hay? Just recently. Amy...what a fantastic gift for all of you. I too have been feeling the urge to scrapbook again. I'd love to help you with that goal. Maybe a GNO scrapbook style? Sending my love and prayers. I am sorry for the loss of your father. The memory book sounds like a beautiful tribute to a wonderful man. Thanks for sharing something so personal. So very sorry for your loss. May you find peace and comfort in the coming days. God Bless you! Brilliant and ever so thoughtful! I feel inspired! Thank you for sharing this! 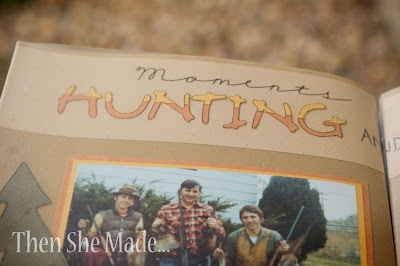 Reading and looking at this beautiful and heartfelt tribute to your Dad so touched me. 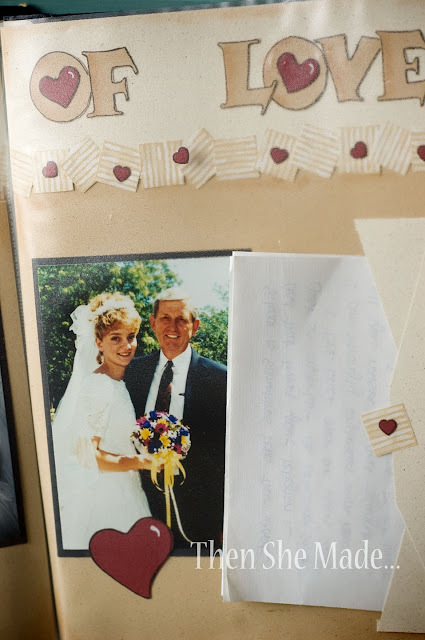 I have very little memories with my Dad because he died at an very young 50 and worked six days a week while I was growing up and he didn't connect much with any of his four daughters. I hope to take your project and words to heart and start writing, just writing, with hopes of giving something to my sons and grandkids. Thank you for this. Blessings to you and your family.